Source Audio Nemesis Delay Review – Best Overall Delay Pedal? There are a handful of big names when it comes to all-encompassing multi-mode delay pedals. Boss, Eventide, Strymon, & Empress Effects all spring to mind. But while Source Audio has been on the scene for several years providing guitarists with unique primarily DSP based effects pedals, they’ve just released their boldest effort yet, a pedal that clearly puts them in the big leagues and seals their place among the upper echelon of delay pedal giants. This pedal is the Source Audio Nemesis Delay. And it just may be the king of the delay pedal hill. We first saw the Nemesis Delay back at Winter NAMM 2015, then again at Summer NAMM 2015, and finally at Winter NAMM 2016 before it was finally released. The Nemesis looked more impressive each time, and the result of Source Audio’s efforts has been unleashed upon the masses. The most exciting aspects of this pedal for most guitarists will be its compact size and 12 onboard delay modes along with tap tempo, selectable tap divisions, and an array of parameter knobs for quickly dialing in the perfect delay sound without menu-diving. But for those who dig a little deeper, the Nemesis gives you 12 more (and counting!) 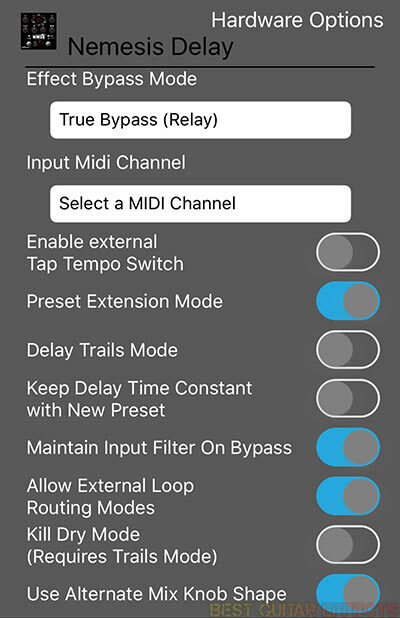 effects engines via the Neuro App, in-depth preset customization, very thorough MIDI implementation, and much more. Let’s find out if the Source Audio Nemesis Delay is the new best overall delay pedal. 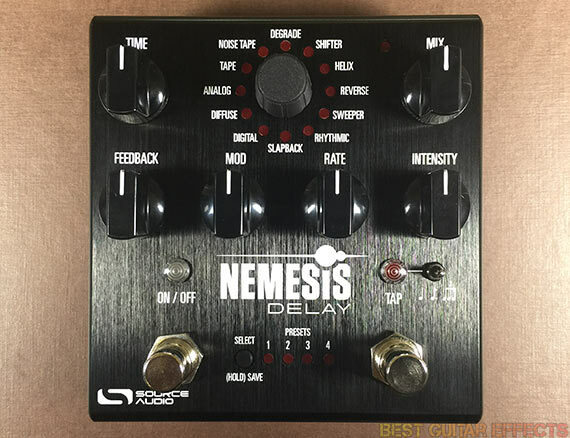 Visit Source Audio for more info about the Nemesis Delay. Good things are worth the wait. The Nemesis is one of those things. It’s also a noteworthy example of a change that’s been happening to digital guitar pedals. Hardware & software are reaching a stage where a new digital frontier is at hand. We’re at the point where DSP processing power is so powerful, that sheer specs alone aren’t as impressive as they used to be. While hardware still matters greatly, especially to tone obsessed musicians, engineers, and guitarists, it’s the software engineers who develop for today’s modern DSP pedals who are contending in an arena where the depth of their programming ingenuity and coding expertise can have an arguably greater impact on the quality of sounds produced than the hardware itself. But let’s talk about the actual physical pedal itself first. 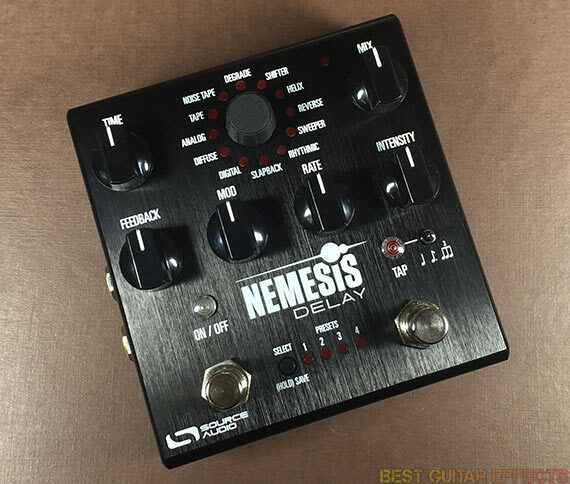 The Nemesis Delay’s compact & sleek black aluminum enclosure houses an efficiently laid out array of knobs and foot-switches, making it known that this pedal is first and foremost about live performance. The bypass can be configured for true relay bypass or buffered if you need to drive long cable runs with the Nemesis at or near the end of your signal path. Delay trails are also available for those who like spillover. The 6 parameter knobs have a nice solid feel and provide easy access to on-the-fly adjustments if you need to reach down to your pedalboard for a slight tweak during a gig. The top middle knob selects from one of the 12 delay engines. I’m not completely confident about the quality of the plastic pot of that knob. A misplaced foot during an erratic display of stage showmanship could cause an unfortunate mishap. In a rack unit or studio environment, I wouldn’t question it at all. But the straightforward ease-of-use of the Nemesis Delay will appeal greatly to anyone who wants tonal options without the menu-diving or a space consuming presence of a larger digital delay pedal. 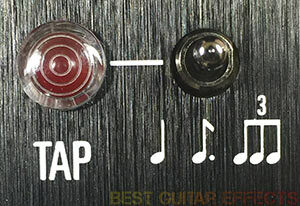 Tap tempo is an infinitely valuable function as always, and Source Audio have improved it’s precision in the latest firmware (along with adding several other minor updates and optimizations, a testament to their continued work on improving this pedal). The tiny flip-switch above the Tap foot-swich gives you quick access to a change in delay feel with quarter notes, “The Edge” style dotted eighths, and triplets are among the initially available choices. 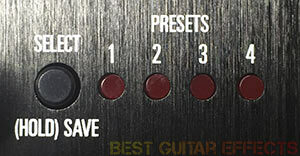 The Preset Select/Save button and accompanying 4 LED’s indicate which preset you’re using. Select selection just takes a simple press of this button. Pushing and Holding the button saves a preset. Be sure to visit the Hardware Options in the Neuro App to extend the range to 8 presets if you’d like more to be quickly accessible. And of course, up to 128 presets can be recalled via MIDI if you need them. We’ll touch on a few other hardware aspects later, but it’s worth emphasizing how efficiently laid out this pedal is if you prefer straight-forward, hands on control. Now let’s talk about the the delay engines on the surface. Out of the box the Nemesis gives you 12 different delay types. Any of these can be overwritten if you’d prefer a different algorithm from the Neuro App. (More on that later.) But these are some pretty great starting points for getting acquainted with the Nemesis. Let’s talk about their sounds in depth. The slapback delay provides those classic single repeat delays from early guitar recordings and rockabilly music. Dial in the Mix around 50%, put the Time a little past half-way, cut the Feedback, and you’re there. The Intensity lets you warm up or brighten the tone for a dark, neutral, or twangy sound. You can get weird with modulation or better yet, crank the Feedback to around 3 o’clock and reduces the Time for bizarro dreamland sound effects. The digital nature of the Nemesis has potential to take traditional sounds to unconventional new places. This is your expected pristine digital delay. Add a little modulation, tap in some dotted eighths, and get your “Edge” on. The Intensity can provide either a low cut for clearing up the low end and getting a brighter Edge-ier sound or a high cut to roll off some treble for a warmer sound. Think TC Electronic 2290 or other similar variation. Here’s our first surprise. The Diffuse engine smears the attack of the delay for a smoother repeat that has an ethereal quality to it. Pair this with reverb and you’re going places. If you’re a shoegazer and love atmospheric guitar-scapes, you’ll definitely have fun with this one. I also like to crank the Mix to fully wet & the Intensity knob to maximum Diffusion while cutting the Time to minimum for a soft-attack, pad-like guitar sound that, again, loves reverb. Boost the Feedback for a reverb-eque quality as you extend the trail of the padded sound. The Analog setting gives you a warmer, darker sound reminiscent of some of the classic analog delay pedals of old. Think Electro Harmonix Deluxe Memory Man or Boss DM-2, only cleaner. The Intensity here can brighten or darken the tone for a clearer or murkier delay sound. The Feedback can give you super long trails that don’t overly saturate the way analog delay pedals often do. I personally rather like the hybrid sound of digitally recreated analog delay algorithms for the extra versatility they provide. While the sounds of this delay engine may not be as lo-fi or gritty as what you’d hear from actual BBD chips, the tones produced are beautiful and well worth exploring. Here we have a duo of classic inspired delay engines. Tape delays get 2 dedicated spots on the dial obviously because guitarists really love tape delays. And of course, the Nemesis may want to dethrone the Strymon El Capistan as your tape delay pedal of choice. The Tape engine gives you cleaner delays of the two. The Intensity can warm up the sound on the left and add some mild saturation and artifacts. 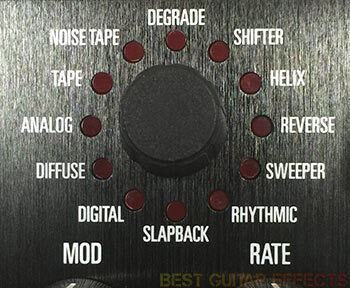 The Mod & Rate knobs give you the wow & flutter of a warbly tape machine. The Noise Tape is darker, grittier – but not so much so. It’s a groggier sounding, swampier delay. The Intensity goes from pretty warm to really dark. It never gets too dirty, definitely not taking your guitar overboard, but it provides enough grit and mojo for a tastefully restrained, moderately warn out tape echo before the machine gets to the point of needing emergency care. If you want noise and artifacts, Degrade is the first place you go. It starts with a clean digital delay line, but cranking the Intensity thins out your tone, anti-aliasing the wet sound until it’s reduced to bit-crushed robot chatter. Lots of fun to be had here. Use expression control to gradually bring in the noise to make your audience feel like there’s a glitch in the Matrix. This engine gives you a static pitch-shifted delay. The Intensity chooses the interval among Octave Down, Up Minor 3rd, Up Major 3rd, Up Perfect 4th, Up Perfect 5th, & Octave Up. The shifting has that slightly glitchy, old-school warble characteristic of more primitive pitch-shifters. It would normally put me off a little, but I like how you can use the Mod & Rate to accentuate this sound for very interesting vibrato effects on the delays. Try maxing the Rate with a hint of Mod, moderate Feedback, and Octave Up for mesmerizing results. An octave up reversed delay? Yes, please. This shimmery gem is another standout engine, perhaps only topped by the Neuro App’s Double Helix (more on that later). The Intensity adjusts from a brighter or darker sound and helps the delay blend into the mix. This engine will have your audience scratching their heads at how you’re producing such bizarre textures from your guitar. Pro Tip: Use the Neuro App to select different pitch shift intervals. You can select from -2 octaves & a perfect 5th all the way up to +2 octaves & a perfect 5th. Also, the Helix engine must be heard in stereo. Use the Neuro App to play with the Tap Panning for a bigger sound. You gotta have a Reverse mode in any fully featured multi-algorithm delay pedal. But the Nemesis has its own spin on the classic sound of 60’s psychedelia. The Intensity will gradually blend in the sound of more delay taps, creating a pulsing, breathing delay sound that sets this engine apart of the usual uninspiring, run-of-the-mill reverse delays. Sure, you can crank the Mix to fully wet and get the whole Jimi Hendrix & Beatles Revolver thing going on, but try blending in your dry signal and experimenting with the Feedback and Intensity for some very original reversed delay sounds. The Sweeper applies a low pass resonant filter to the delay line. The Intensity & Mod control the Q & Depth of the filter, respectively; Rate controls speed. Since it’s different to sync faster speeds with your delays via knob control, I generally like to go with a long, slow filter sweep that extends over several measures. If you want to get more out of this mode, use the Neuro App to lock the LFO with the delay time. Cool, but still limited. I’d like to see a future Neuro App update that allows different multipliers, so you could have the filter sweep lock into your delay at contrasting divisions – for example, a long whole note sweep over a dotted 8th delay. There’s some potential to improve the applicability of this engine, and I think Source Audio can address this easily in a future update. The Rhythmic engine gives you a clean digital delay with 8 selectable multi-tap delays, each with 3 taps and various rhythmic feels. This engine is a good place to go with you want little more rhythmic variation than a simple dotted 8th. This is another engine that shines in stereo. Be sure to fire up the Neuro App to play with delay Tap placement. The Nemesis comes with a 1/8” to ¼” cable for connecting to a compatible phone with 1/8” headphone jack. Download the Neuro App, power up your Nemesis Delay, and you’re good to go. General operation is straight-forward. Select the Nemesis pedal from your touch screen and dive into the Sound Editor, Browse Sounds, or Hardware Options tabs. Browsing for sounds is a fun way to discover new ideas through other people’s preset creations. Not that you’ll ever run out of inspiration, but loading up some of these sounds can offer a fresh perspective. The Hardware options panel is essential for selecting bypass mode, activating trails, selecting MIDI channel, or allowing effects loop routing among other things. The Sound Editor is where you go to get deeper parameter access and load up the additional delay engines. 12 Neuro App exclusive delays were available at launch, and more are on the way. You can manually set BPM and delay time, set the Maximum Delay Time, and apply some parameters from other delay engines to others of your choosing. You can add Diffusion, Distortion, Sample Rate Reduction, and even apply the resonant low pass filter. You can then send these changes to the pedal and even “Burn” a particular delay engine over one of the pre-existing Factory Delay Machines. The Neuro App is generally pretty easy to use for sound editing, but as I mentioned previously, I’d like to see selectable divisions when syncing the LFO to the delay time. Also then trying to adjust some parameters, the interface can be a little challenging to dial in precise values. The Pitch Shift Interval comes to mind as it’s tough to select that perfect interval from the touch-screen. I’d like to see slower tracking speed for easier adjustment of Pitch Shift Interval and other parameters. Now let’s talk about the bonus delay engines available through the Neuro App. The Resonant Analog engine was inspired by the MXR Carbon Copy & Way Huge Aqua-Puss, mid-range present analog delays that are regarded as classic among their many fans. This engine does a great job of emulating that style of analog delay, complete with saturated self-oscillation. With the Intensity at noon the sound is more mid-present. Lowering it darkens the sound into Boss DM-2 territory. Raising the Intensity brightens the delays for a cleaner sound. I do like the original Analog engine, but it can be very tempting to Burn this one over it. Another winner. This engine applies Tremolo over your delayed signal. Intensity sets the depth of the tremolo. You can also add vibrato with the Mod knob. Rate controls the speed. I find it challenging to get much out of this engine without selectable locked LFO divisions. This engine could be greatly improved with a Neuro App update. In the meantime try the Reverse engine with higher Intensity for tremolo-like ambient delays. The Sequenced Filters delay engine applies a filter across 4 delay taps, each being centered at different frequencies for a step-sequencer style sound. This engine is great for rhythmic delays with added harmonic interest as the filter cascades down with each success delay tap. The Mod section gives you standard pitch modulation for even more movement. I personally enjoy this more than the default Sweeper filter delay. Sequenced Filters is a solid Burn candidate. As the name implies the Dub engine evokes the sounds of those high-passed delays you hear in dub music. The delays have a bright, diffused sound and sit in the air above your playing. The Intensity takes the tone from bright to very thin. This one’s especially fun to play with higher Feedback settings as you can let the trails build up without cluttering up the mix too much. Add a little modulation and you’re set. The Chorus & Flanger engines are similar beasts in that both replace the standard modulation with unique modulation effects. The Chorus provides a lush stereo chorusing effect; the Flanger gives your delays those classic jet flanging sounds. The Chorus’ Intensity warms and brightens the sound while on the Flanger it takes you from a neutral tone to a thinner, brighter flanging sound. Both are excellent at slow Mod & Rate settings. With the Flanger I like cranking the Mod to max and keeping Rate slow for those churning flanger sounds. The effect isn’t overly prominent so your dry sound will still come through clearly with the flanging behind it. Similar to the default Rhythmic engine, Complex Rhythmic gives you an extra 4th delay tap with 8 options based on subdivisions of 8 and 5 options based on subdivisions of 6. If you love rhythmic pattern delays, this adds even more flexibility for finding a rhythm that suits your tastes. Between the 8 options under Rhythmic and 13 options here, that’s 21 different delay tap pattern sequences to choose from. Like the standard Rhythmic engine, this mode also shines in stereo. Comparing this engine to Degrade, Lo-Fi Retro is darker and has more of a brooding quality that I really like. Cranking the Intensity yields plenty of that bit-crushed, 8-bit brunch, but less dramatic settings reveal a delay decay that seems to chew up your guitar with each repeat. It’s totally rad. Sounds as if your guitar is being force fed into the chomping jaws of an original NES console. In the manual it’s called Warped Record. In the Neuro App it’s called Warped Vinyl. Either way, it should be clear that this engine is inspired by the sounds of an old LP left in the dust under the sun for too long. The modulation adds warble; the Intensity brings in distortion and filtering. I wouldn’t say it’s the most authentic warped record emulation I’ve heard, but this engine seems to have its own flavor of lo-fi, artifact ridden coloration and movement to add to your delay line. Certainly fun to play around with. This is another standout for those who like it weird. The Compound Shifter pitch-shifts the delayed signal with each echo being further shifted by the selected interval, “compounding” the shifting effect. By default the Intensity selects from Octave Down, Up Minor 3rd, Up Major 3rd, Up Perfect 4th, Up Perfect 5th, & Up Octave. Try setting it to Up Minor 3rd for ascending diminished harmonies. The Up octave does the shimmer delay effect well with repeats cascading up out of audible range. A fun and essential thing I must recommend is to assign the Pitch Control to the Intensity knob in the Neuro App. This lets you use the knob to select plenty more possible shift intervals. Try setting it to a half-step up or down for dizzying stepping delays that will induce vertigo. And be sure to explore the many other descending delay intervals aside from just the Octave Down. 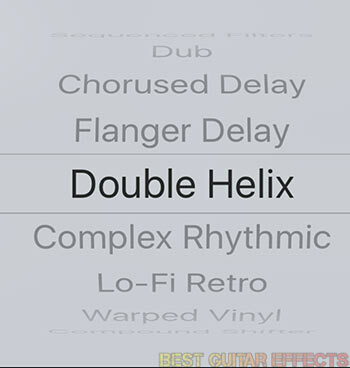 Fans of Helix & Double Helix need to try this one. The Oil Can is inspired by those old oil can delays and provides some of the darkest, murkiest, swampiest delays you’ll hear from the Nemesis. The Intensity goes from dark to extra dark, so you’ll have no problems dialing in a shadowy delay that swims in the tar pits below your dry guitar signal. I like to crank the Feedback relatively high with this one. Modulation helps as well. The delay’s saturation isn’t overly distorted, and the warmth this engine imparts makes it a viable alternative to the Analog & Resonant Analog engines. The latest firmware adds these 2 new variations of the classic Binson Echorec. They’re not yet available from the Neuro App, but when they are I’ll update this section with my impressions. But it’s great to see Source Audio extending the Nemesis Delay’s machines beyond the initial 24 offerings. I’m a huge proponent of MIDI implement in digital pedals. What first caught many guitarist’s attention when seeing the Nemesis was the thought of Strymon TimeLine caliber functionality in an El Capistan sized enclosure, including MIDI I/O. Source Audio went above and beyond in this department. The Nemesis has a separate Nemesis MIDI Implementation manual, and the pedal pretty much gives you MIDI access to every parameter and function. If you want to control and automate the Nemesis from a DAW like Ableton Live, you can. If you just want to select presets from a MIDI compatible effects switcher, you can. MIDI Clock sync? It’s here, and Source Audio has made continuous effort since the Nemesis Delay’s release to further optimize MIDI functionality in recent firmware updates. The Nemesis is a win in this area. The Nemesis is massively flexible in terms of I/O routing. Playing the unit in stereo is an exercise in consciousness expansion. Basic ping pong, delay to one side, and Kill Dry (for wet/dry guitar rigs) are all available. And as I’ve said before, be sure to get into the Neuro App and play with the Tap Panning options. You can create some massively expansive delays that play and dance across the stereo field. If you’re running the Nemesis in Mono you can use Input 2 & Output 2 as an effects send & return pre or post delay for coloring your guitar sound with other effects. Infinite creative potential here. Whether via MIDI control or with a dedicated expression pedal, the Nemesis Delay begs to be controlled in real-time. Plug in an expression pedal and hit the Control Input button, and you’ll access exp based volume control, great for creating pad-like delay swells. You can also set the range of the expression pedal from the Nemesis as well as easily programming the automation for up to all 6 knobs. All of your exp configuration settings can be stored with the preset, so you can create unique expressional control for each one. There’s also an input port for connecting the Nemesis Delay to Source Audio’s Hot Hand Motion Controller, Neuro Hub, and other interfacing products. All-in-all I think Source Audio have done a commendable job at incorporating the most essential functionality into the surface controls of the pedal. Some guitarists will gripe about having to rely on the Neuro App to access the mostly excellent 12+ extra delay engines. Also, I’d like to see the Neuro App tweaked a little for easier delay tweaking. As for the hardware design, everything feels solid except for the flimsy plastic potted engine selection knob. Feels okay for general turning and should be fine in the studio, nestled in a rack unit, or on a bedroom guitarist’s board. But if you’re a world touring pro and take your pedalboard on stage night after night, just don’t let a drunken stage diver trample on your ‘board and jam this knob. But in terms of sound quality, the Source Audio Nemesis Delay sets the stage for world class delay sounds in a dual-footswitch, Tap-Tempo enabled compact delay pedal. The Source Audio Nemesis Delay is arguably the best overall dedicated delay pedal in an enclosure this size thanks to the many high quality delay sounds it offers. If you just need a versatile Tap Tempo enabled delay pedal, the Nemesis is a win. If you want a dozen easily accessible & tweak-able onboard delay engines (plus 12+ more via the Neuro App), the Nemesis has you covered. If you want stereo, MIDI, presets, effects send/return, expression control, and more, the Nemesis is very hard to beat. And Source Audio is continuously adding features (and new delay engines! ), making the Nemesis an exceptional value and dangerous rival to any other delay pedal that might still be lingering on your pedalboard. That concludes our Source Audio Nemesis Delay review. Thanks for reading. Want To Buy The Source Audio Nemesis?